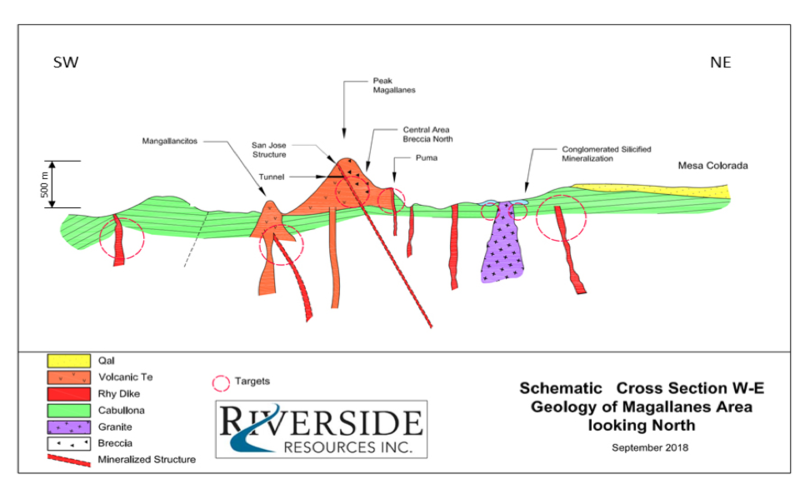 Maurice Jackson of Proven and Probable covers the five Cs with the CEO of Riverside Resources, including his company’s take on copper, prospects in Canada, and the Cecilia deposit in Sonora. Dr. John-Mark Staude: We really believe copper is in a long-term upswing. Myself, I worked in the copper business with Magma Copper and BHP Copper. Now Riverside has built a copper portfolio to be ready for this now-growing upswing. I think the demand from Chinafrom Asia[as well as] the growth in the United States and throughout the world, along with electric cars, electrification [means] copper is in demand, and we’re ready for it. Mexico, being a major copper producer, is a wonderful place to be developing copper projects. Maurice Jackson: Speaking of the project portfolio, let’s delve into it. 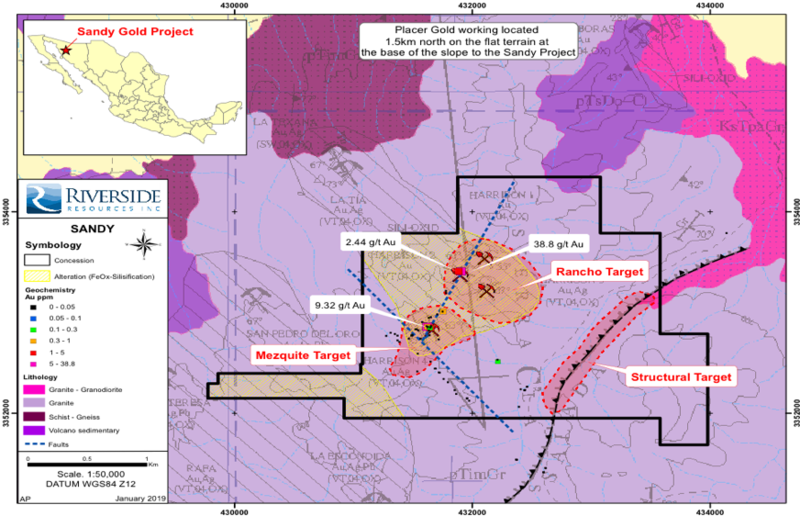 Dr. Staude, last April I attended a site visit with you in Sonora, Mexico, and we visited the Cecilia gold-silver project. The value proposition before us on the Cecilia has enormous potential. For someone new to the Cecilia gold-silver project, please tell us about it. Dr. John-Mark Staude: That’s the second C: Cecilia. And the thing we like about it is the location. It’s in a major mining trend, where gold is being produced by other mining companies, gold and silver companies like Premier Gold Mines Ltd. (PG:TSX) and First Majestic Silver Corp. (FR:TSX; AG:NYSE; FMV:FSE), as well as the recent big discovery by SilverCrest Metals Inc. (SIL:TSX.V). Riverside, at the Cecilia project, has a major district, over 60 square kilometers’ tenure, big-scale potential for a mega-discovery. It was great to have you up there, Maurice. In fact, I was there last week. We’re progressing, getting ready to do drilling. In the next quarter, we’ll see continued results from the Cecilia. We’re really excited by that for Riverside for 2019. Dr. John-Mark Staude: For us, the key lithology is a rhyolite dome. The thing about a dome is it’s the right type of impulse, the type of thing that can have gold mineralization. Also, they’re veins, and those veins have high grade. The veins are inside of sediments. Those sediments are the typical types of sediments that have gold mineralization. 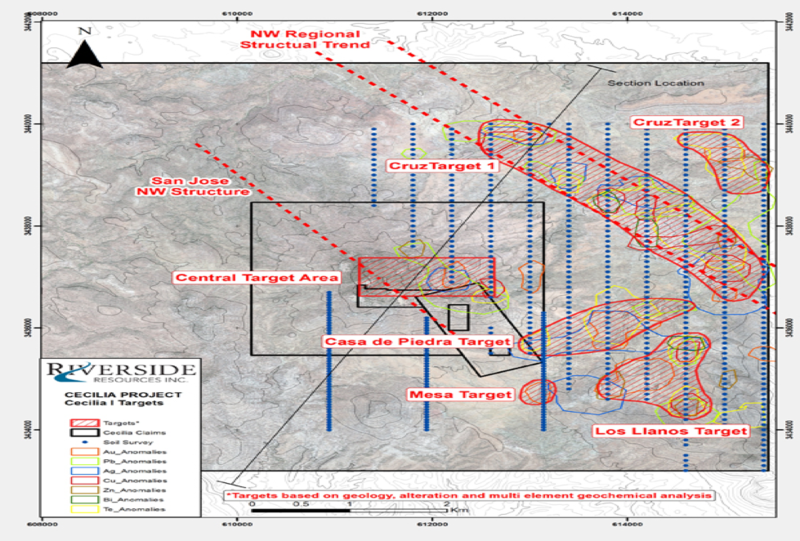 Major mines around Mexico: For us, it’s a great type of geology, so we really like the Cecilia project. Dr. John-Mark Staude: One of the virtues we really like is the proximity to the surface. Gold mineralization, one- and two-ounce gold on the main hill. . .also, gold in the Cecilia one, the larger area. Those types of things are exactly [what] we like: high-grade gold, one- and two-ounce gold, half an ounce gold. Those types of mineralizations over long distances of strike lengthwe’ve been able to follow with 500600 meter-long strike lengths of these veins. Great project. Really exciting for Riverside to be moving ahead with. It’s 100% owned by Riverside. Dr. John-Mark Staude: The key three things right now, first is bigger ground. The district is big, and we keep picking up more ground. That’s huge. We’re really consolidating the major play. The second is high grades. We’re following the veins along strike, and getting good results along those strikes continuing. The third is, the tracking of multiple targets. We’ve been able to develop quite a few targets, and now we’re upgrading those targets, getting them ready for drill. We’ll get the drill permits completed for the larger area. We already have the permits for the Cerro Magallanes, and then we’re ready to go. Riverside is so excited by the Cecilia project. We’re on track, on budget, and it’s really going well for us. Dr. John-Mark Staude: The Sandy is good. It’s out in the Sandy Desert. Sonora is a desert area, and we think underneath that sand, where we have an outcropping area with high-grade gold and big structures, those structures are the orogenic gold-style, which is affiliated with the big mines that are run by companies like Fresnillo Plc (FRES:LSE) and Alamos Gold Inc. (AGI:TSX; AGI:NYSE). Big structures like the Chanate mine, the Noche Buena mine, the Herradura mine. Riverside at Sandy is in the right place, the right type of geology, and the big scale potential. We believe we are on the right path based on what we have staked. We use our database, where we try to take knowledge and turn it into gold, [which] is exactly what Riverside stated it would do. With the Sandy project [we] would show delivery of our promises. Now we move that ahead. We’re very excited about these type of high-quality projects, and a low cost of acquisition for Riverside gives us huge upside with limited risk. Dr. John-Mark Staude: First, [I’d like] to say thank you. We went back to existing shareholders, and many of them actually participated in the financing. It’s often difficult to raise capital, but for Riverside, we’ve tried to deliver what we’ve promised, and we really appreciate the shareholders. Second, as we put out in the news release, we’re so excited now that we have capital of over $3.5 million (CAD) with no debt. Riverside’s in a great position to grow, not just in Mexico but beyond Mexico. That cash allows us to do multiple things: Cecilia, further growth and do additional transactions. Riverside’s in a great position. Cash is king, and Riverside was able to get that cash and through financing, which has us really excited for 2019, 2020, 2021. Great position for Riverside shareholders. Maurice Jackson: Let’s move onto to the fourth C, which is Canada. Is Riverside actively participating in anything in Canada? And if yes, what can you share with us? Dr. John-Mark Staude: Yes, we are. We’ve actually had properties in the past for porphyry copper in British Columbia. . .We are based in Vancouver, so Riverside has a good ability to operate here. We have been acquiring and working on different grounds, and we’re putting those together. And I think the thing that we’ll be seeing is news flow of the development of an additional portfolio, and then joint venture partners on it. Riverside likes the prospect generator model, and Riverside’s very keen to diversify into Canada, because it is a great jurisdiction to work [in]. We have a lot of partners that people want to work on projects here, so it fits with our skill set to diversify. So Canada’s been going well, and we raised the cash, and now we’re diversifying and growing. We’ll be at conferences and beginning to progress that in the next six and eight months. Maurice Jackson: Let’s move onto the final C, which is capital structure. Please update everybody on the new capital structure. Dr. John-Mark Staude: That’s one of the most important things, and Riverside has been so careful. We now have 62 million shares out. We’re in a very good structured position, [and] continue to be a tight share structure. After 13 years as a public company, we’re glad to actually have the cash, and we think now, with that tight share structure, we can continue to grow as a prospect generator. It’s a great place to be. Myself, I’ve participated quite a bit in this current financing, and I participated in the other financings, and to date I’ve never sold a share of Riverside. I wish I had more shares. I’m glad to have a big share book, and Riverside doesn’t have too many shares out, and capital structure’s intact, doing well for Riverside. Dr. John-Mark Staude: The next key thing for us is really refining those drill targets at Cecilia. I think in the next 25 days, next month, we will have results, and we will have the results from our sampling. What will determine success will be. . .One is making sure we have all the access for the big targets. Second [is the] continuity of those targets, then third is confidence in those targets. Riverside will drill the targets ourselves. We really like the Cecilia project. We’ve been progressing it ourselves, and we see great value. The market has not given us the respect we think we deserve, so Riverside’s pushing it ahead ourselves. We’re very excited by this in the coming months. Maurice Jackson: John-Mark, what keeps you up at night that we don’t know about? Dr. John-Mark Staude: It’s so important to diversify and we really want to, so for us, keeping me up at night is us delivering growth in Canada now. We’ve been able to do it in Mexico quite well. We know we can do it, but we know shareholders want to see it, so right now, we’re working on that and looking forward to providing updates on our progress in Canada. And with that, it’ll show that we’re able to diversify, as we’ve done in the past. We know we can do it, but we want to do it with power, by creating great value for our shareholders. Dr. John-Mark Staude: Well, you’re always so good at asking questions. I think you’ve covered a lot of things. I think the other thing. . .to ask how is Riverside [is] going to grow. And the way we continue to grow is with those projects, with joint ventures, and lastly, because we’ll actually add more skilled people. Riverside will be adding other key people to help us grow; in the next six months, we’ll be actually looking to spread out and expand beyond where we are in Riverside, with power and growth. So I think that’ll be the next step to grow, that will deliver in Mexico, will deliver on Canada, and where we’re going next. We’re really excited by that, so Riverside’s a great place to be holding shares today. Maurice Jackson: And as a reminder, Riverside Resources trades on the TSX.V: RRI, and on the OTCQB: RVSDF. Riverside Resources is a sponsor of Proven and Probable, and we’re proud shareholders of Riverside Resources for the virtues conveyed in today’s message. And last but not least, please visit provenandprobable.com, where we provide mining insights and bullion sales. You may reach us at [email protected].